Take a ride in a Golden Hawk. 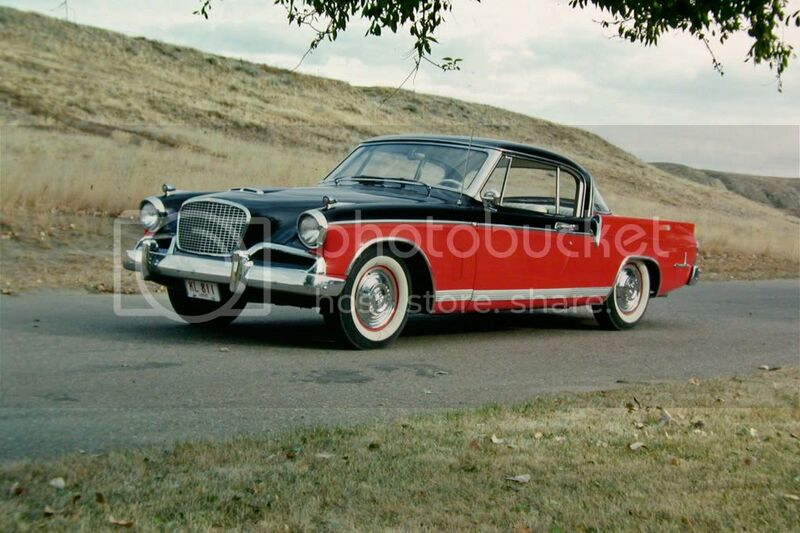 One of the Studebakers that people remember most is the Hawk, specifically the Golden Hawk. Goldens were produced only for 3 short years, as 1956-57-58 models, yet they made such an impression that when you say "Studebaker", that's what comes to most folks' minds. Sure, all Golden Hawks are special; they were the ultimate offerings of performance and luxury from Studebaker. Based on the seminal hardtop coupe body created by Bob Bourke for the 1953 model year, they were classy, stylish, sporty and fast. But the 1956 models were extra special: for that year only, you could have a Hawk with the big-cube Packard 352-cubic-inch V8 - a rocket ship if there ever was one. And although there was a full nest of Hawks in that inaugural year - Golden, Sky, Power and Flight - the Golden was the only recipient of that big Packard engine. And only about 4,000 were built, in Studebaker's South Bend and Los Angeles plants, making the Golden a rara avis indeed. Frank Ambrogio has been in love with "56J" models (shorthand for the factory model code that designates these birds) for a long time. In fact, he began the Golden Hawk Register, to track known survivors - running or not - in 1989. His site also features technical information, manuals and authenticity guides, and personal stories, including the tale of how Frank found his first Golden (he owns two) under a pile of garage dung in 1983. If you're interested in finding out more about these wonderful cars, check out the Golden Hawk Registry pages at www.1956goldenhawk.com. Just goes to show that you don't have to be an old coot to love Studebakers, and also that you can find some really nice ones out there if you put your mind to it! Read more about John & Tracy's Studes on their blog.